As part of the seminar on personal finance I gave this week, I did some research into how one can obtain a free credit score. In general, I don’t think you need to know your exact credit score. You should check your credit reports regularly to make sure there are no errors, but beyond that you really don’t need to do much else to guard your credit score. Part of the complexity on this issue is that there are three major credit bureaus reporting data for your FICO score, Experian, TransUnion and Equifax. They each compile a credit report and score on you. Plus, there are many other version of credit scores from other groups out there as well that compete with the FICO system. They all have the same purpose – to assess your creditworthiness for lenders – but they go about it in slightly different ways and might be drawing from slightly different data. 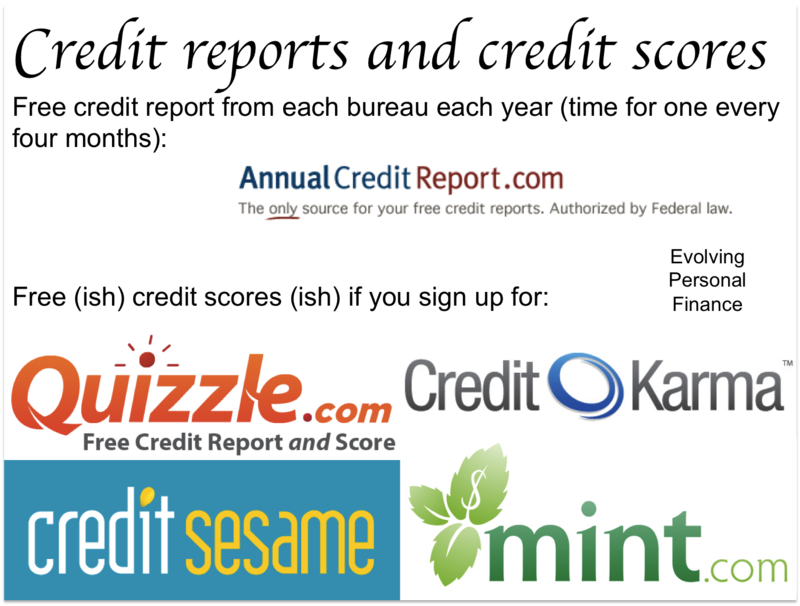 Here is another (cut for time) slide from the seminar I gave this week on the basics of credit reports and scores. The credit score plot is from Complex Search. 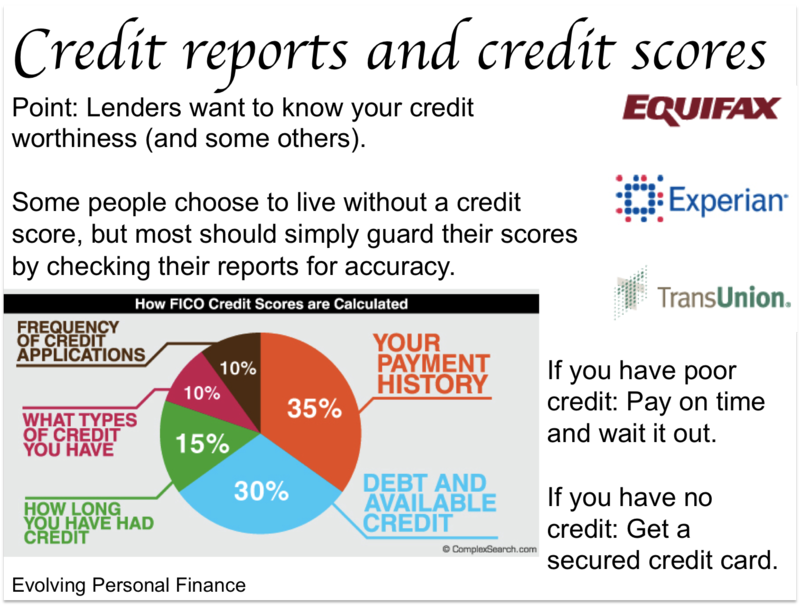 Here is another (cut) slide on where to get your credit report and credit scores. Mint: Mint is a great tracking and budgeting tool (Kyle and I use it) so the free credit score is just a bonus. You can get your Equifax credit score by using the link on the Overview page that says “Get your free score.” You need a Mint account and the answers to a few more questions for identity verification. Credit Sesame: Credit Sesame also works with Experian to get your credit report for free and the free credit score is Experian’s National Equivalency Score, which is on the scale of 360-840.
Credit Karma: Credit Karma provides a free credit score (a VantageScore) and a TransUnion report as well as credit monitoring and other tools and calculators. I’m glad there are so many companies out there trying to empower consumers with this information! Have you been able to check a version of your credit score for free in the past and if so which company did you use? Did you realize there were so many versions of the ‘credit score’? Adding Credit Cards – How Many Is Too Many? Why Do Stay-at-Home Parents Need Their Own Credit Cards? 12 Responses to "Get Your Credit Score (ish) for Free (ish)"
I tend to stick with one credit bureau so the score I receive is measured in a consistent manner. I usually use Equifax to get my score but I pay about $20 each time because I want the full report plus recommendations. Equifax is also what my bank uses to pull my credit history when considering a loan. But at the same time it’s also a good idea to get credit reports from other bureaus to cover all the bases, for a better chance to catch any mistakes or fraudulent activities. Great suggestions all around! But why are you so intense about your credit report/score? Are you preparing to take out a mortgage? I’m thinking about buying a car next year 🙂 I’m doing some research into what kind of rate I can expect to get on a car loan. One important thing is credit pulls affect your score for one year, but stay on your report for two years. So before one applies for a loan, to help qualify for the best rates they shouldn’t apply for new credit for two years. I agree, you don’t really need to know your score…except maybe if you’re planning to apply for a loan in the near future. For most credit cards, a score of 700+ (maybe more like 720+ or 730+ for some of the better ones?) will suffice. Bit of a tangent – my score (Barclay told me the score after my credit card app with them last week) is 731 on TransUnion, and I was still getting credit cards. I now have seven cards! I started my history with just a secured credit card last September. On a grad student salary. With nothing else reporting on my credit report. Building a good credit score was an easier and shorter process than I expected. I didn’t think it’d be this quick before I got approved for some really good cards (like the Amex Premier Rewards Gold card. I am churning this one =) ). That is good for me to know when talking with students who have no or a short credit history. It’s pretty amazing how willing these companies are to lend! (And it’s not out of the goodness of their hearts.) I don’t know how you’re churning many cards – we can’t seem to feel confident about it very often and we have two people spending! Are you able to put your rent on a credit card or are you manufacturing spending…? I’m going to MS. I’m waiting for my cards to come in the mail so I haven’t done it yet, but my plan is to buy those prepaid debit cards, and then liquidate them through either Evolve Money or Walmart’s bill pay or money order. And if the liquidation doesn’t work, well then I just spend down the prepaid debit cards. I’ve also been reading about this Amex for Target thing, and Amex campus edition that I might try too. But yea, definitely MS’ing. Or just buying actual gift cards to places I normally buy stuff at to give myself more time to spend $2000 in 3 months, because I don’t spend anywhere near that on my credit cards normally. I have been using Credit Karma for my credit score, but I’ve been thinking about trying the Mint version–I’m all for consolidating! I hope the presentation went well last night! Credit Karma is a good service, too – Kyle uses it, actually. If you already have an account, why not keep it? I used myFico to get a credit score a few years ago for $20. Since then, I’ve just monitored my free reports. Yeah, I checked my credit score (some version of it, anyway) a few years ago and haven’t felt the need to since, just occasional peeks at my credit reports. Now that I know I can see it through Mint and one of my credit cards, I guess I’ll check it out! I use GetCreditScore, which features the VedaScore credit score. It is fast and completely free, confidential, and more importantly no impact on my credit report. However, it is only for lenders and credit providers in Australia. Thanks for notifying the other Australian readers to that service!